With so much fresh corn in my kitchen this week, I finally had the chance to make some corn chowder. I’ve had this recipe in the works for months now, but I wanted to wait to share it when I could make it with fresh corn. I’m happy to say that it was worth the wait! My whole family (even the non-spice lovers) enjoyed this meal very much. 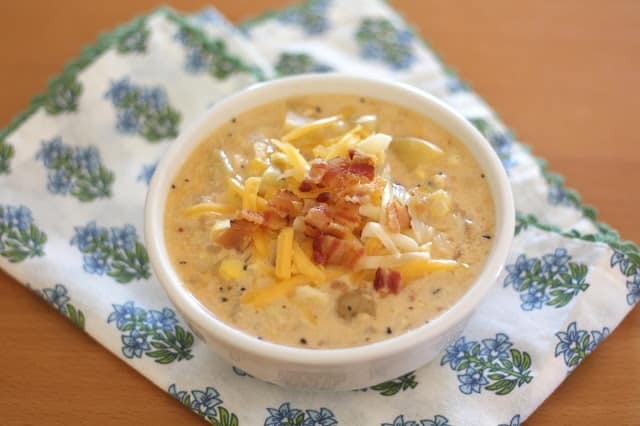 The corn is simmered in a creamy soup with chunks of potato and flecks of chipotle peppers. Right at the end, a splash of lime brightens the flavor, making this chowder exactly what I had hoped. 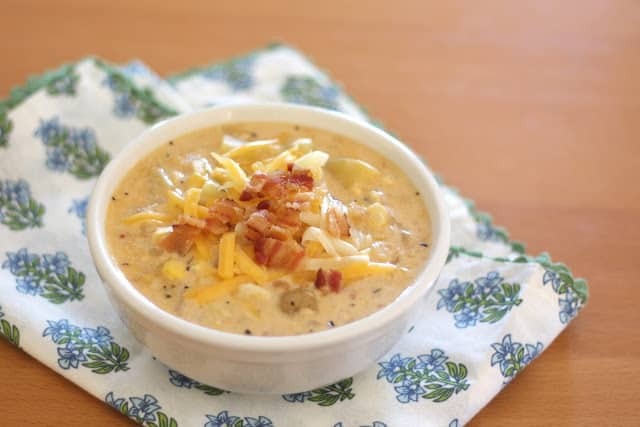 My boys commented repeatedly on how delicious it was and my husband and I both agreed that this chowder needs to happen again before all of the corn is gone. 1 small onion diced very small, about 1/4"
3 cups diced Yukon gold potatoes no bigger than 1/2"
Let the potatoes cook for about 10 minutes, until tender. Stir frequently. Add the corn, the lime juice and the chipotle liquid. Let the corn simmer for about 5 minutes, then add the cheese and stir to combine. Let it simmer for a few minutes more to completely melt the cheese. Remove from the heat and serve immediately. Top with additional cheese and crumbled bacon, if desired. Enjoy! « Can I Get Your Input? Please Take A Quick Survey! Another great use for in-season corn. Thank you! This is a great late summer (use up the last of the corn) get ready for fall type of a recipe! I love the addition of the chipotles...sounds great, Mary! 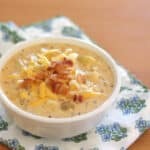 I'm usually just lukewarm on corn chowder but this may be the best sounding version I've seen - maybe it's the chipotles - and your shot of it makes me want a bowl now. I have to try this on one of the upcoming cool Fall nights, it seems hearty and warming. I everything went well until I add the lime juice. Its separated the milk. What happened?? That's so strange! I've never had this happen. I'll remake the soup this week and test it again myself. Thank you for letting me know!